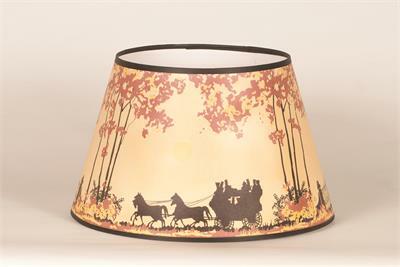 The Aladdin Lamps Coach and Four Parchment Shade in Autumn features rich yellows, oranges, and browns. Styled after the Aladdin shades of the 1930's and 1940's. The Coach and Four Shade in Autumn is a decorative yet economical lamp shade choice.Features black, shadowed shapes of horses, along with a horse drawn carriage, trees, and fencing. 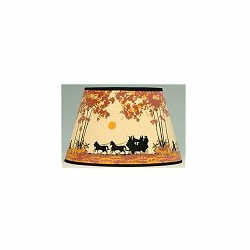 Stunning with Brass Table Lamps or older Amber glass Table Lamps.